In early June of 2014 Forti and Goldstein discussed the process, struggles, joys, and implications of being the subject of a large-scale curatorial endeavor. Critical Correspondence is reprinting this conversation, in light of the current Judson Dance Theater: The Work is Never Done exhibition at The Museum of Modern Art. 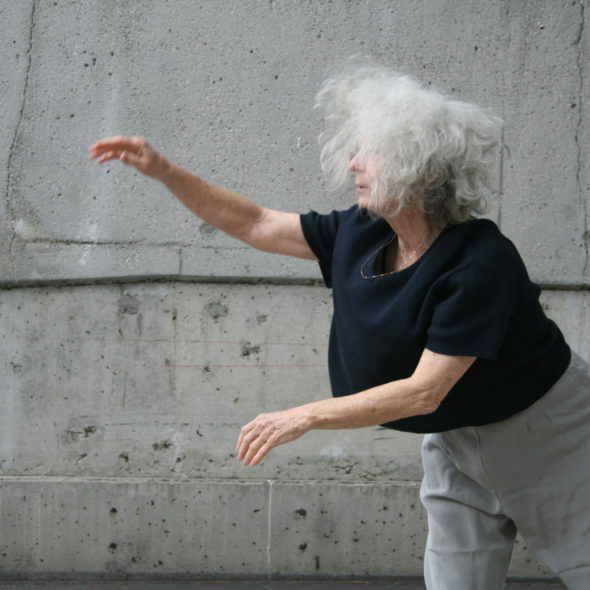 In it, Simone Forti's Dance Constructions can be seen performed on Tuesdays, Thursdays, and Saturdays at 11:30 a.m., 1:30 p.m., and 3:30 p.m. throughout the exhibition. Since the early 1960s, Simone Forti has explored relationships between movement, objects, text, sound, and site. She has performed, taught, and displayed works in both the dance and visual art communities for decades, and as a result, her contributions have become touchstones for critical debates on dance and the museum. While Forti is perhaps best known for her Dance Constructions (1960-61), an opportunity to situate her early choreographic innovations within her larger career narrative will be possible when Simone Forti. Thinking with the Body: A Retrospective in Motion opens at the Museum der Moderne in Salzburg, Austria, on July 18, 2014. This retrospective, organized by Sabine Breitwieser, will bring Forti's workshop practice and live performances together with drawings, journals, holograms, video (documentation and otherwise), sound art, and installations. In the following interview, Forti describes re-discovering her archive, anticipates seeing a career's worth of work all together, and considers the role that the art world--both museums and commercial galleries--might play in the preservation of dance. Jennie Goldstein: Hello, Simone. Let’s talk a little bit about your upcoming retrospective, Simone Forti. Thinking with the Body: A Retrospective in Motion, which opens on July 18 at the Museum der Moderne in Salzburg, Austria. I’m motivated to have this conversation—somewhat selfishly—because I likely won't get to see the show in person. So I wanted to have a chance to talk more about it with you and also to have the opportunity, via the Movement Research/Critical Correspondence series “Dance and Museums,” to share some of your thoughts about it with a wider audience. JG: I thought I would begin by asking you about the exhibition title. Or, rather, both parts of the title: "Thinking with the Body," and "A Retrospective in Motion." Starting with "Thinking with the Body," I wonder if that language was something you came up with? Was a turn of phrase that the curator read somewhere? What are the origins of that title? SF: I really think it was Sabine [Breitwieser] who has a good understanding of my sensibility. I think this notion of “Thinking with the Body” is part of what interests her about me. So she came up with that title and I was very happy with it. JG: What do you think she means by it? How does it resonate with your own feeling about your work? SF: Right. Well, Let me think a little bit. And in fact I'm pacing all over the place….I should get more into this thought and have some explanation. SF: It’s [thinking with the body] is a basic aspect of how I work. I don't know if we're all like this, but I know that when I'm trying to understand something, of course I have my rational tools, but also I almost feel some kinesthetic and visual models in space--tendencies of energy and of how things are going to unfold. For instance, in my News Animations performances I tap into a kind of swirling combination of images, memories, details, and information related to the news media or stimulated by the news media. I'll have a feeling about things that I can express verbally. But if I can be moving, too, I can get that feeling of pressures and tensions. I can feel when a situation breaks, when it's been stagnant or under opposing pressures for a long time and then I can feel when something changes somewhere. I can use the verbal--try to specify what those tensions are, what it is that changed, how it changed. But I also feel that in my body and I can express it also using my body. JG: Do you think that the second part of the title, "A Retrospective in Motion," is connected to how you just described the process or idea of thinking with the body? SF: Well, "Thinking with the Body"--I really relate to that statement. "A Retrospective in Motion" is perhaps more like PR. JG: Fair point. Well, I was going to say it's the part of the title that allows an audience to understand what category of show this is. SF: Yes, that's right--that there's going to be performance in it. JG: I couldn't help but wonder if maybe Sabine was also referencing your  book, Handbook in Motion. A Retrospective in Motion...Handbook in Motion. SF: Oh! Of course. I must say, of course I've been very excited, you know, in a happy way, about having this retrospective happen. Part of me has been a little nervous about getting defined about having everything on view instead of in, you know, the recesses of my subconscious. And to see everything out together in the light of day….But when I heard the title that Sabine had come up with, I thought: OK. If I'm going to get defined according to her vision of me, then this is a good sign. The title is a good sign. JG: How did the idea to plan the exhibition come about? Sabine, I'm guessing, approached you? What kind of conversations were you having that led to this? SF: Well, there has been an ongoing conversation with the Museum of Modern Art. 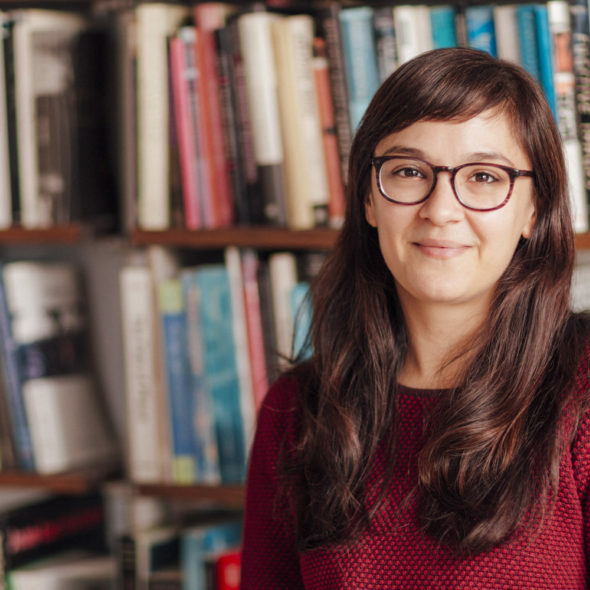 First, Jenny Schlenzka [formerly assistant curator of media and performance art at MoMA, now associate curator, PS1], when she was working at the museum, had come up with the idea that they might want to purchase Huddle. And, of course, we got into a lot of conversations about what that means. After Jenny moved from the Museum of Modern Art to PS1 and Sabine became the chief curator of media and performance art at MoMA, Sabine expanded the idea that they might want to purchase all of my Dance Constructions—the pieces I made in 1960 and 1961. They are kind of conceptual pieces in that they're an idea. The movement is not exactly pedestrian because it has to do with climbing; it has to do with standing in a rope that hangs in a loop from the ceiling. So the discussion expanded. It's interesting because it is really a conversation about how an institution can take on the responsibility of keeping those pieces alive--of making sure there's someone, or people, around who can teach the pieces. So I made--with my gallery, The Box--I made videos of me teaching the pieces to students in my UCLA class. The documentation would help an institution keep those pieces alive. Sabine was very involved with that conversation. Then, she took the position of director at the Museum der Moderne in Salzburg [in December 2013], and she proposed doing this retrospective there. JG: So, the acquisition talks at MoMA are ongoing, but separate from the planned exhibition in Austria. SF: Yes. Now there's a new head of that department. JG: Yes, Stuart [Comer, chief curator of media and performance as of September 2013]. SF: And Stuart is very interested, too. So, we--Mara [McCarthy] from the Box gallery and Stuart and Ana [Janevski, MoMA’s associate curator of media and performance art], and I--had a meeting, oh, maybe four months ago. So, we're still talking about it. It's been an interesting conversation, and the more the conversation goes on the more it's really a conversation. I don't know that it'll ever happen. JG: It's not a straightforward acquisition, in the way that a traditional painting or sculpture might be. So I can see why it would require rounds of discussion. Jennie: I know these logistical negotiations are common in museums that are invested in showing dance. The questions that follow are, of course, how might an institution acquire dance--what does that mean and what does that process look like. Simone: Right. And say another institution wants to borrow a piece. The original institution has to have someone who can go out and make sure it’s presented accurately, you know, the way they make sure a painting is hung properly. And the museum doesn't have a person like that. So would they want to join forces with an institution like Dancspace, for instance, that would know how to do that? Judy Hussie-Taylor [executive director, Danspace Project] has contributed to the conversation as well. It's been a very interesting conversation. I'm not holding my breath about it. JG: [Laughs] Let’s return to the discussion of the upcoming show. You already hinted at an answer to my next question when you expressed your initial trepidation about the idea of having everything out all at once, the idea of your (ongoing) life's work shown all together. I am curious to know what you think about the retrospective as an exhibition model. As a museum-goer do you get excited to see a retrospective of an artist you like? Do you find yourself feeling as if the model doesn’t work? SF: This is going to open up a whole paragraph here. First of all, I'm very happy about the retrospective. I'm quite known, especially in the art world, for those pieces that I did in my early twenties. But it's wonderful that a more complex view--with my ongoing work through the decades--will be presented. The dance community has been aware of me, as one among many who have done a lot of creative work in the field through performance and also very much through workshops. In the dance community workshops are as important as performance in terms of an oral tradition that's ever-evolving. JG: That's a good point. SF: There won't be much of a reference to workshops in this retrospective, but there’s going to be a lot of drawings, a lot of which I made when I was doing animal movement studies. The drawings were sketches I made in the zoo to help me understand the movement and the experience of the animal in captivity. Then I did a series of pieces that were more like installations, and they're not known. And I'm just hoping that all these different times, periods, and kinds of work that I did will talk to each other and will make a whole that makes sense…that there will be a show. JG: I think, in a way, that's the curator job--to make that show. JG: You mentioned how different communities come to your work in different ways, and that the art world tends to be more aware of your Dance Constructions than they are of other parts of your practice. The Dance Constructions have certainly gotten a lot of attention in exhibitions recently. I first learned about your work through your holograms, and I've always been interested those works. I know there is one in the collection of the Whitney Museum of American Art [Striding Crawling, 1977]. SF: Yes. And the holograms have a lot to do with--especially the one that the Whitney has, where the figure goes from standing through the transition to being on all fours and then back up to standing--my animal movement studies and also the evolutionary study. I was spending time not just in the zoo but in the natural history museum tracing the different shape of the thigh bone, for instance, going from a reptile that has the leg out to the side to, let's say, to mammals standing on four limbs with the bones directly down under the weight of the trunk, to standing. Striding Crawling takes one movement and presents it so that the one movement is complete in and of itself--which is very hard to do in performance. JG: How did you start working with holograms? SF: I was married to Peter Van Riper who was a musician and a graphic artist. Peter was very close friends with the holographer Lloyd Cross. Lloyd invented and developed this multiplex holography, which I call animation holography. And so Peter suggested that Lloyd and I do some work together. JG: And how many of them did you make? SF: Originally I think there were six or seven. But I would lend them out for exhibitions and then not really keep track of their coming back. Those were the old days. JG: This notion of keeping track of what you’ve made brings me back to a point that came up when we met at your home last September . You were telling me a bit about what it was like to build an archive—to discover what you had in your files in the run-up to the show. I recall you said you were surprised—and pleased—to fully realize that you'd been drawing all along, that you had all of this work. Does that sound right? SF: Yeah, yeah. I've seen the museum. I've been there. And my show is going to be on a whole floor and it's a big beautiful space. If you had told me I had work to fill that space I would have just laughed. And then amazingly stuff started coming out from under my bed, from the closet. I have dozens of journals filled with drawings and writings. There will be some journals on view. JG: But not all of them. SF: Which is good! There's still some stuff here [in L.A.]. And then I had a moment when I thought, "Oh my god, everything I've made is in a shipment. What if the ship goes down?" And then I thought, "Oh well.” You know, we dancers, that's one thing we're good at. You know, like you do it, and it's gone. JG: At the same time, museums are often positioned in contrast to ephemeral arts. Museums collect, and conserve, and put things on display, often for longs period of time. But in a way, a retrospective, a three-month-long exhibition like yours, shares impermanence with a dance performance. A retrospective encourages a present audience--if you miss it, well, you miss it. No installation photographs or other documentation will offer quite the same experience as having been there. SF: Yes. That's true, but there will be a catalogue. JG: Yes--that was my next question. Museums solve part of the exhibition impermanence problem with the catalogue. What was it like to work on it? What shape is it taking? SF: Well, the main aspect of the catalogue preparation that surprised me and that I got involved with was having conversations with the contributing writers. Several people were asked to write something for the catalogue. Some then wrote to me and said, "What should I write?" And we got into a discourse, a lot of emails going back and forth, they were showing me what they had written. They asked me: "Is this OK?" So I got into a whole dialogue with Steve Paxton, with Robert Morris, with Fred Dewey. That was very interesting. JG: Did you also become a bit of a fact verifier? SF: Yes, but to a very great extent the gallery, The Box, has done that. And [artist] Jason Underhill, who is still my assistant, but was already my assistant for two or three years before this [retrospective] came up, knows more information about my work than I do. So, sometimes someone will ask me: when did this happen? And Jason will be standing next to me while I'm thinking, and he'll just get the date. And also [artist] Rena Kosnett has been spending time in my files and figuring out what photographic images we have and organizing them in groups. I'm cc'd on a lot of the emails, but I'm so grateful that I don't have to do that work. JG: Right. It is a lot of work to put exhibitions together. SF: A lot of work! SF: --Well, by the time I saw it I felt I could. When I did my Sounding show at The Box [September 08 - October 27, 2012], I realized that I have a sense of space, that my work can define space and doesn't have to fill space. So that there’s a unified experience rather than--now look at this now look at that. JG: Have you worked closely with Sabine on the checklist and what goes where or are you more hands off? JG: I’m interested to hear more about the range of materials and pieces slated for display. You've mentioned drawings, journals, and some installation work. Are you also going to have photographs? Video documentation? SF: I think so. I think there will be photographs; there will be posters. There will be videos, of course. I guess more documentation of performance, but also a couple of video pieces. And there'll be installations. For instance, I have one piece called Cloths, which is usually to be performed, but just the props and the video of the performance with the props could be there. The props are wooden frames that are perhaps three feet square. And there are three of those, and there are a series of cloths of different types--you know, like the types you can get at the Salvation Army. Actually, the original ones came out of Trisha Brown's sewing basket. Or some of them did anyway. These cloths are attached to the top of the frame, and it starts out with all the cloths flipped back and there's a performer squatting, hiding behind each of the three frames. And they occasionally flip a cloth over the frame and into view. Whenever they feel like it, they each start singing a song. They can sing two songs during the ten-minute performance. So there's sometimes silence and sometimes an overlapping of songs. The audience maybe sees one frame is covered in black, one is plaid and brightly colored, and another one is a pastel flowery print. Then suddenly another cloth flips over and there's a bright red there. The performers either walk in and pick up frames that are sitting on floor or walk in with the frames and then squat down behind them and you don't see them again for the duration of the piece. JG: And is that going to be performed live? Or will the installation include the props and then video of a previous live iteration? SF: I'm not sure yet. Dancers are going to be working live on the Dance Constructions. Each day for the duration of the show there are going to be three of the Dance Constructions performed and not always the same three. JG: In the past you've spent time in a city where the Dance Constructions are being presented and you work with local dancers to teach them the pieces. SF: Yes, I'll be doing that. I'll be going a couple of weeks early and part of that time I'll be training the performers. SF: --Where will they hang out? JG: Well, will the construction hang out? That's what I was going to ask. Will Slant Board be there? Will Hangers be hanging? SF: Yes. They will be there. And there will be photographs of different performances of them. And videos. JG: Will you perform at all? SF: I probably will do something at the opening or around that period. I'll be there, so it would be, you know, too bad not to make use of me. JG: That’s true! Retrospective exhibitions, in a way, require artists, curators, and audiences to look back in order to create and experience something in the present. Did the process of organizing this show spark new questions or ideas for you about the future? In addition to the ongoing discussions with MoMA about the Dance Constructions, do you think about scores, specified documentation, written instructions, designating certain people who could teach your work, etc. SF: There's an awareness of how to take care of the work that's already happened. So there are legal questions like who's going to teach it? Who's going to take care of it once I'm gone? Do I want to set up an estate so that there's someone who's responsible and who can be approached if someone wants to show the drawings or do they directly approach the gallery. Legal things like that. Then there's my view seeing all the work in one place and how it works together. I think I...I also have--again it's like thinking with my body. I have a different physical experience when I think over it. I kind of feel a bigger field with all these parts in it together. It's a different kinesthetic experience. I kind of liked not knowing what was stored in Vermont, what was stored in a basement in New York, and what was stored under my bed. JG: But now you know. SF: Now I know. And there's that. There's also--I think what was starting to happen-as museums were getting more interested in dance, as I was starting to be considered, you know, an older, important dancer, and an important choreographer--is that there are many more requests. Sometimes there's not for several days but then sometimes a day comes there's two requests for an interview, two requests for a workshop, sometimes I get three requests for work at once. And I'm also wondering about periods of time over the years where I kind of came to the end of one kind of work. Maybe because something basic in my life changed, like if my marriage with Peter Van Riper, the musician I was working with, broke up, then we weren't going to be doing that work anymore. What was I going to be doing? And that sense of being out in space and scared and worried about, you know, how can I live without having something I'm working on? What form is that going to take? I need those empty times of just being scared. And, as you get older it can happen that your work is not as creative anymore. JG: It also sounds like maybe you don't have as much empty time anymore. SF: Oh, yes. And none of us do. I mean it's a much more hurried life now. Empty time scares me, but it's an important scare. JG: I want to return to the role of the workshop—particularly to what you said about their importance in the dance community. Can you say more about their role in your work? Those in the dance community will know just what you mean, of course, but I think those who align more with art world--who are excited about dance but maybe don't know all this history--might learn from your description and experiences. SF: Yeah, good idea. Well, you know, as you were talking, it occurred to me that, for instance, painters go to work in their studio. The paint is there, the canvas is there, they'll try different things, they'll make sketches. I think we dancers do that in our workshops. We try out ideas. We engage actively in the question of what is our material. How trained is the body and in what way. How do we formulate our ideas. So that going to teach a workshop is kind of like stepping into your studio, but with the added sense of responsibility that not only are you working out ideas but you have to work out how to communicate them. You have to work out are they meaningful to this generation. This is now a question I have because I don't want people in my workshops to not be interested. So, all of that work that in other mediums goes on in a more private way, for dance it goes on in the workshop. JG: Is this connected to being a teacher? SF: How do you mean? JG: If you're teaching a workshop do you call upon techniques that you would use in the classroom setting as a professor? SF: Oh, when I teach at UCLA I don't teach any differently then when I teach a workshop. JG: So they're very connected. SF: Yes. And I want to say, I had taken a few dance classes here and there when I was twenty, but it never really interested me until I met Anna Halprin. And she was teaching workshops. We were not standing, you know, in formation facing the mirror with the teacher facing us. We were in space. She was talking about ideas, she was giving us an idea to explore, and then we would show each other what we'd found by exploring that idea. I'd come across the workshop idea a little bit in a few art classes I had taken in college or even in high school when I was going to an art school sometimes on Saturdays or after school. In those classes we would be given ideas to explore. But finding out that you could do that with movement--that's when I knew that this is what I was going to do. And that's where I was taught how to teach. I still teach the workshop process that I learned from Anna. JG: Thank you for sharing that. SF: Come to think of it, something of the workshop process actually will be presented in the show. I’ll be training the performers to do the Dance Constructions, during the week prior to the official opening. We’ll do that in the museum and the public will be welcome to watch. And we’ll have plenty of time to work with some related movement scores, which will help the performers get an understanding of the aesthetic. JG: I’m glad we were able to discuss the process leading up to your exhibition today. Audiences—exhibition audiences and dance audiences alike--have access to the finished product, but are often left to imagine the origins of an artwork, dance, or exhibition. The effort that went into its making can be beyond the viewers’ reach. Art critics rarely address curatorial process or talk directly to artists about what it is like to be the subject of a retrospective. I’m often wondering: how did an artist get organized? How did the artist and curator figure out what to include? I was hoping that maybe given all of the conversations that have been going on--in the dance world, the art world, and in the places where they meet--about how dance operates in art museums that maybe this conversation could be a nice way to bridge some of these seeming divides. Perhaps the divides are in part rooted vocabulary, terminology, or issues of basic exposure, and not necessarily about fundamental differences between the disciplines. SF: I find this interesting what you're saying. And when you first asked me, you know, if we could do this interview, I forget how you phrased it, but something about dance and the art world. And I thought: not another one. JG: Right, right. It's been such a topic. SF: It's been such a topic, and you know, when I'm feeling kind of stressed out and grumpy I'll think, why don’t they just read each other's interviews instead of making another one of the same? SF: But this has been quite different. JG: A discussion of process is perhaps more interesting than questioning what the museum wants from the dancer or the dancer from the museum. SF: Right. I mean--that's been so talked about. I'm sure there are aspects of it that we really need to think about, but I'm glad that this took a different track. JG: Oh, good. I'm so glad. JG: Best of luck with the final preparations leading up to the show. SF: Thank you and good luck with your projects.